I’ve been noodling on this idea for weeks now, just too busy with youth farmer’s markets and cooking classes to actually find time to tinker around in the kitchen. But when I picked up my CSA bag tonight and found corn in it, I rushed home to give this a try. 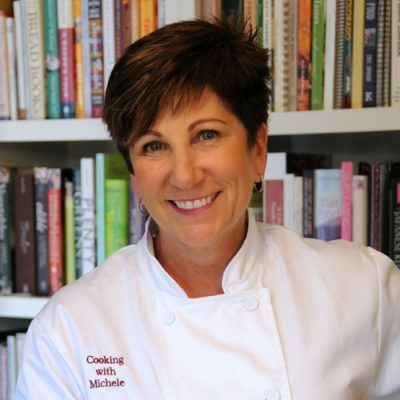 I love corn and basil together – it’s one of my favorite herb combos – and several weeks ago I ran across a recipe for sweet corn frozen yogurt. And that, my friend, is how I come up with recipes! I see one thing, think of another, and decide on my own. 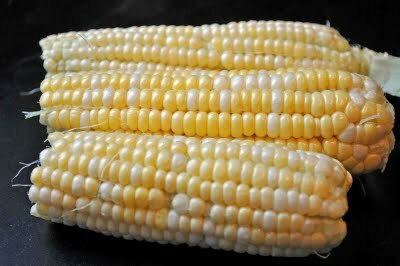 I started by cutting the kernels from the cob – these were kind of small so I added a little more to equal the amount I would have had from 3 good size ears of corn. …and then transfer that to a double boiler. From here I proceeded the same way I do making any vanilla custard based ice cream. 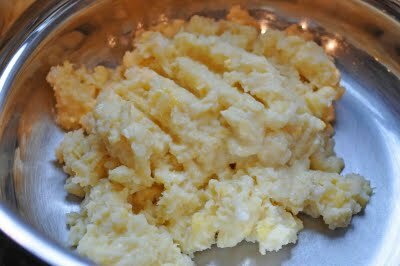 I added 2 cups of milk, 1/2 cup sugar, and 5 egg yolks, stirred it all together, then let it begin cooking. While it was heating up I was plucking the leaves from my basil plants (I made more pesto and froze it since my daughter took all of my last batch up to college with her). 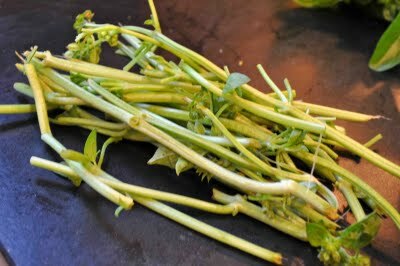 While the stems aren’t good for pesto, they are packed with basil flavor, and they are perfect for infusing basil flavor into my ice cream. I put about a cup worth of stems into the ice cream base and let it cook with the other ingredients, stirring it often to prevent lumps, until it was thickened. At that point I removed it from the heat, dumped the whole pot full into a covered container and added heavy cream to it, covered it, and put it in the fridge to chill. I’ll let it steep that way overnight and then will finish it off in the ice cream maker tomorrow morning when I promise I’ll post a picture of the final product (which I’m very likely going to eat for breakfast if I have my way). 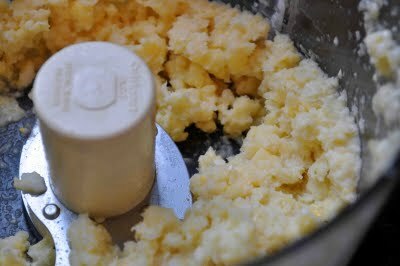 Cut kernels of corn from the cob and process in a food processor until crushed and creamy. Place in a double boiler and add milk, sugar, egg yolks, vanilla, and basil stems. Cook over simmering water until creamy and slightly thickened, about 10 minutes. Remove from heat and pour into a large container; add heavy cream. 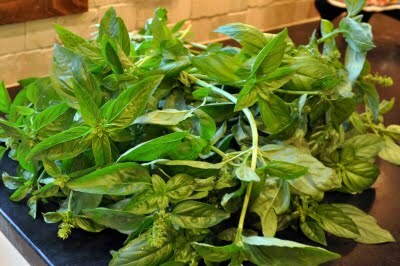 Refrigerate until chilled, then remove basil stems and process in an ice cream maker according to manufacturer’s directions. Finish freezing until firm the in the freezer. 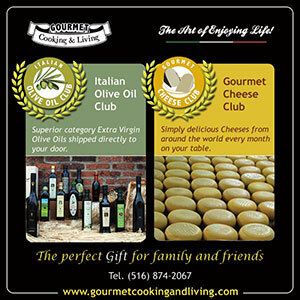 Foodbuzz 24, 24, 24 – Appetizer to Dessert on the Grill!